Cesar Sayoc, who was arrested during an investigation into a series of parcel bombs, is escorted from an FBI facility in Miramar, Florida, Oct. 26, 2018 in a still image from video. 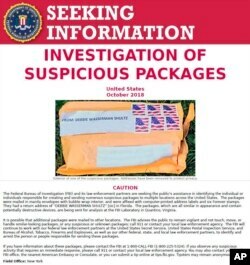 The FBI released this poster, Oct. 25, 2018, asking for the public's assistance in finding the people responsible for sending suspicious packages to multiple locations across the United States. “Criminals make mistakes so the more opportunities that law enforcement has to detect them, the greater chance they’re going to be able to act on that, and that appears to be what happened here,” said former Justice Department official Aloke Chakravarty, who prosecuted the Boston Marathon bombing case. The gate is closed at the entrance to a house owned by philanthropist George Soros in Katonah, N.Y., a suburb of New York City, Oct. 23, 2018. Officers watch over the scene outside the Time Warner Center, Oct. 24, 2018, in New York. Law enforcement officials say a suspicious package that prompted an evacuation of CNN's offices is believed to contain a pipe bomb. As the packages rolled in, technicians got a breakthrough: a fingerprint and DNA left on a package sent to Rep. Maxine Waters, a California Democrat and one of the intended pipe bomb recipients, and DNA on a piece of pipe bomb intended for Obama. The FBI said it had identified no other possible matches on the evidence it had examined. FILE - Cesar Sayoc appears in Minneapolis, Minnesota, in this Aug. 31, 2005, handout booking photo obtained by Reuters Oct. 26, 2018. He said Sayoc had been talking about politics to everybody at the club for the last two weeks, preaching the need to elect Republicans during the November elections. “I just figured he was passionate about the upcoming elections,” Meigs said. The next morning, Sayoc was taken into custody near an auto parts store in Plantation, Florida, north of Miami. Across the street, Thomas Fiori, a former federal law enforcement officer, said he saw about 50 armed officers swarm a man standing outside a white van with windows plastered with stickers supporting Trump and criticizing media outlets including CNN. “He had that look of, ‘I’m done, I surrender,”’ Fiori said. 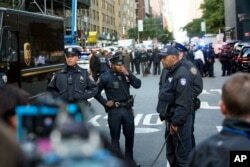 Who Is the US Mail Bomb Scare Suspect?